After working on infographics with the Year 5 class and helping the Middle School teachers use infographics in their lessons I wanted to see how it would work with year 4 students. The students were doing research on immigration emigration and migration of people as part of their Unit of Inquiry. In math they were focusing on charts and graphs. This combination led perfectly to having the students work on infographics. The students were divided in groups and were given a country to research. 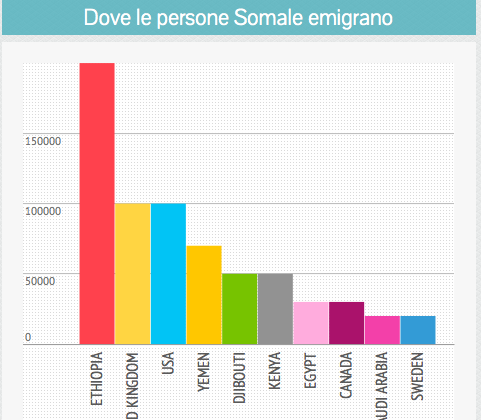 The countries were chosen based on the high number of immigrants from each country in Italy. They were asked to look at the statistics and inquire about the reasons for their countries immigration and emigration statistics. I did an introductory lesson on Infographics and gave the students and opportunity to explore the piktochart.com and infogr.am websites. The students were then free to choose between the two sites for their infographics. All groups chose infogr.am because of the wider selection of graphs and charts that could be used. We discussed the expectations with the students for the visual presentations. They needed to keep the images and graphics on topic. What is the population of these countries? What countries and bodies of water surround these countries? Where do the people from these countries emigrate to? How many people emigrate from these countries? When the students had finished collecting their information they began inserting the information into their infographic. To assess we are using observational notes and a rubric. This was a very successful unit, in large part because of the collaboration with the classroom teachers. We all worked together and held only co-taught lessons. This had a huge advantage, it allowed the teachers to get first hand knowledge with the software which in turn allowed them to work throughout the week directly with the students on the project. The PSHE teacher at my school, who is quite tech savy, has been looking into software he can use with iPods and iPads (if possible also Android) in his classroom. He found the free Dartfish EasyTAG app that he has been using for the past two weeks that he feels gives adds greatly to his lessons. This app allows the students to track what is happening in the games that they are playing in real time. For example if they are playing a game called Speed Ball the people who are not participating in the current game can keep track of the stats for their classmates. 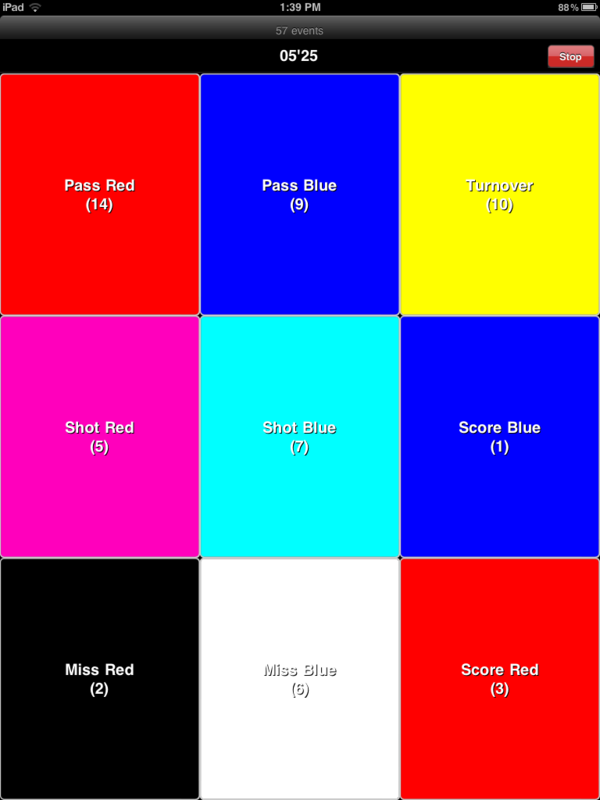 You can set up different scoring panels for different types of games. 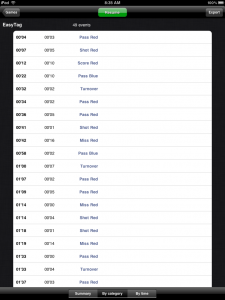 You can keep track of different match-ups as well. Another great aspect of this app is that you can export the results either via email or through iTunes. For more information on the product you can visit the Dartfish EasyTAG website. Or you could just download the FREE app and give it a try. The more time I spend trying to figure out the best way to integrate ICT into my PYP classes, the more I keep changing what I am doing in class. Technically the students were working on projects that were related to their unit, but the connection was limited and was more of a project based unit and not inquiry based. This year our single subject teachers (ICT, Music, Art, PE etc.) along with our PYP Coordinator came up with a plan to make a strong and stable connection with one unit from each year level. That way they could work with the classroom teachers on all phases of the unit. During the other units of the year we would still focus on using inquiry based projects. These projects would more be based on the concepts or skills that were associated with the unit. I also added an idea I got from listening to Brad Flickinger’s podcast of trying to have the students learn one skill really well throughout the year. For example: Year 5 – Documentaries, Year 4 – Podcasts. Having each class only for an hour a week proved to be to limiting for this approach. I found myself having the students working to often with pen and paper in my classroom. Another problem is that it would also take us more time to finish each project than was allotted to each unit. Over the winter holiday break I read through the ICT in the PYP documentation from the OCC. I noticed that I had good ideas but I was still teaching classes that were too independent compared to what they were doing in class. They suggest that the ICT classes be used as a tool for the classroom, with limited stand alone lessons. They also suggest not to make a project just for projects sake but to have it be more meaningful to what the students are already doing in their classrooms. I spoke with our Board and PYP Coordinator to establish a way for me to meet with each class on a bi-weekly basis to better integrate what they are doing in their classes with what is being done during my lessons. I know I should have been doing this already but my time at the school is precious due to the fact that I am the ICT teacher and I am responsible for taking care and fixing all of the tech related problems in the school. The classroom teachers are really enthused with this new possibility. We are already coming up with fun and exciting ideas on how to use technology in their lessons. Connecting both to their units and also to their stand alone lessons. This is just starting and I will keep you informed as to how things are going in the next few weeks. When I came back to school this September, I was informed that the school decided not to hire a part time ICT teacher for the middle school. In the past our middle school had one hour lessons each week of ICT. I worked with a partner to split the middle school classes, while I taught all of the primary school. Our school also offers ICT to half classes where I only have up to 13 students at a time. The Idea to integrate ICT into the Middle School was not new to me and it was actually something we had talked about the year before, but talking about it and actually implementing it are very different. Last year I worked very closely with one our school’s Middle School teacher to develop lessons and implement them during my lessons. We created many different and interesting activities such as: wikispaces.com autobiography sites, iMovie presentations on technology’s impact on the environment, prezi.com presentations about paradigm shifts that were brought upon by technological advancements. This year the challenge is putting those same practices in action with all of the middle school teachers. Finding a way to meet with all of the teachers as much as possible is key to making this work. At the moment there is no time set aside specifically for these meetings. I have already started working often with one of our English language teachers and plan to start meeting the Italian teachers next week.